The Film: The rescue team Go-Go-Five, serving as civilian firefighters, EMT's, and police (apparently they have been out of the Ranger game for a while), are fighting a large fire in the city. In the midst of this chaotic scene, the evil warrior Poly Bear appears, followed by the TimeRangers. Poly Bear defeats the Rangers and escapes. The rescue team is less than impressed by the performance of their counterparts from the future. At the spaceship of the Rotanze crime family, the sorcerer Pyelle appears and claims that by use of his dark powers, he is the one who enabled Poly Bear to triumph. Pyelle works his magic on several more warriors, who confront the TimeRangers and the Rescue Rangers (who have acquired new transformation devices). Both Ranger teams, and the dark warriors, are scattered through time by Pyelle. In the present, the Rotanze family loots the city. 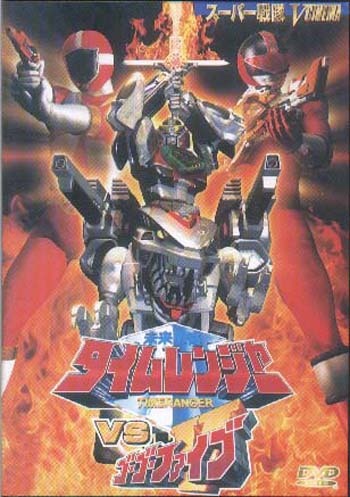 It’s up to Dr. Shen (the scientist father of the Rescue Rangers), the TimeRanger’s robotic Tracker Owl, and Time Fire (aka Quantum Ranger) to figure out how to retrieve the Rangers to defend the city. Extras / Menus: There are a few minor extras on this disc. There is an option to watch several of the film’s fight scenes in a row. No alternate footage or additional narration is offered. This runs 12 minutes, and considering that the movie itself is only 42 minutes long, is completely superfluous. 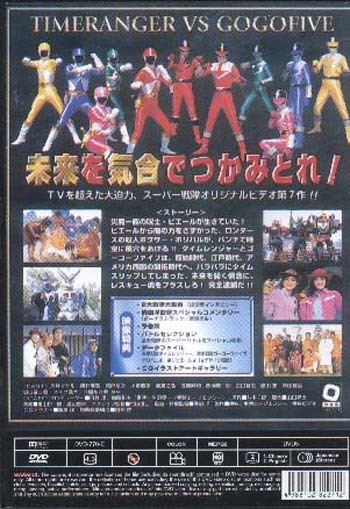 There is one trailer for the film, and a single still image of the promotional artwork. There are also four character / group profile screens, with text in Japanese. One is dedicated to the TimeRangers, one to rescue team Go-Go-Five, one to Poly Bear, and one to the giant monster formed by Poly Bear and Pyelle. The main extra is the interview with the cast. The actors who portray the Rangers pair off and talk about the film and each other. These interviews run 5 minutes, and aren’t very in-depth.